Making bath salts with herbs and essential oils is easy to do. A great mason jar gift that is affordable enough for everyone on your list. 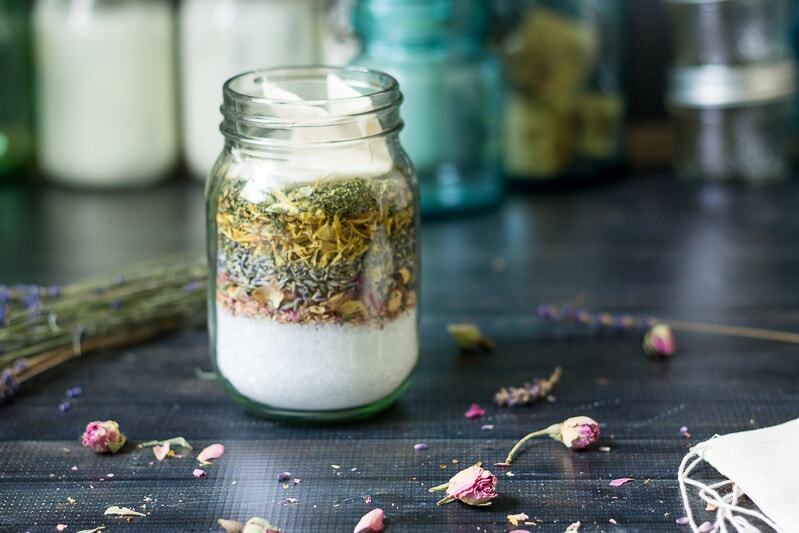 Making bath salts is a fun and easy craft, and makes a great gift for any time of year. This project starts with Epsom salts and essential oils. Then you add layers of dried herbs for added beauty and health benefits. Best of all, it looks so pretty in the jar. The materials for this project include Epsom salts, which have long been used to soothe achy joints and sore muscles. Layered with herbs like lavender, known for relaxation, calendula, and rose petals to soften skin, this “salon in a jar,” is as wonderful to look at, as it is to use in the tub. Note: The information on this site is not intended or implied to be a substitute for professional medical advice. If you have any concerns about using these materials please check with your doctor first. Pour some of the Epsom salts in a jar. I used about 1 cup to this pint-sized mason jar. Next, add 20 drops of lavender essential oil and stir. Followed by 1/2 cup of rose petals, lavender, calendula flowers and 1/4 cup of peppermint. Add a little drawstring muslin bag on top. You can layer the herbs in any order you want. Increase or decrease the amounts. Add or subtract the herbs. Other choices are rosemary, lemon balm, chamomile, and sage to name a few. You can also skip the lavender oil, or change it to the one you prefer, or already have on hand. Use a pretty Weck jar like this one instead of the mason jar. Click on the image below for a pdf sheet of the tag. Handmade gifts are some of the best ways to thank those you love during the holidays, and really any time of year. 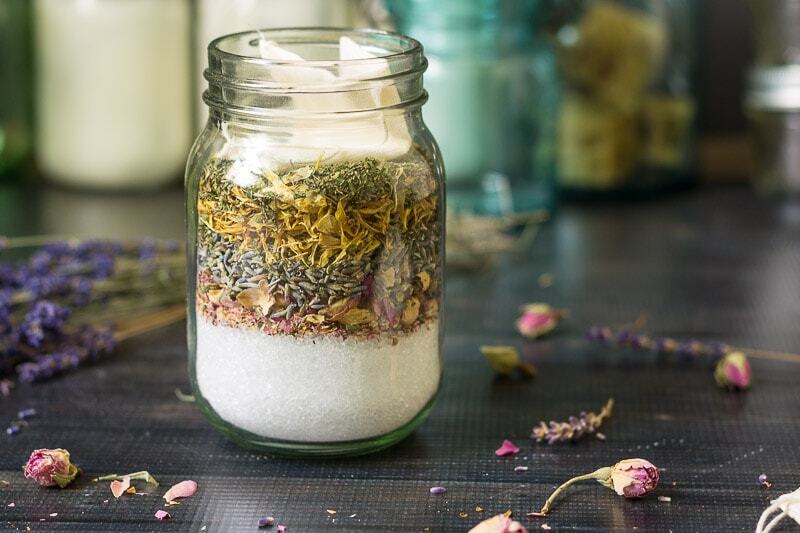 Making bath salts, like this one in a jar, has the added bonus of looking pretty all on its own. So even if they are a shower person, I think anyone would love displaying the jar as part of their bathroom decor. I can’t wait to do these! We are on QUITE a budget so this will be a great gift to give! Thank you for your ideas! They make great gifts Beth. Enjoy! Love this! How long will the jars stay good for? The essential oils and herbs will fade a bit over time but they should last for several months. What a great gift idea, thanks for it! Love the Week Jars. I need to try this. Thanks for joining us at the Inspiration Spotlight party. Shared. Gorgeous! What an elegant and pampering gift! Pinned and sharing. 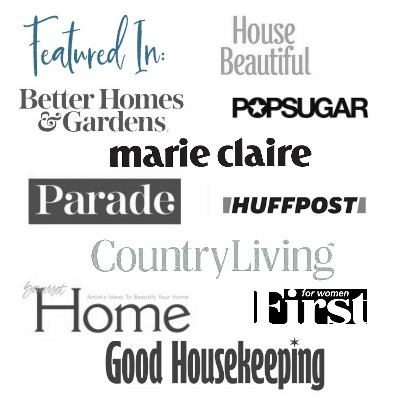 Thank you for linking up at Family Joy Blog Link-Up Party this week. We hope to see you back again starting Sunday at 12 EST. This look heavenly Patti! I love using herbs in the bath… they are always so calming and smell wonderful <3 Thank you for linking your recipe up to the Inspiration Galore Project Party last week. Pinned and shared. Have a lovely weekend. Thanks for this – I’ve bee looking into essential oils more lately and this is such a great idea! Thank you for sharing at the Share the Wealth Sunday party – we hope to see you again soon! Love it, and a great gift! thanks for sharing on craft schooling Sunday!